Before hanging up his jersey in the rafters, the Spurs said gracias to Manu Ginobili by squeaking past the lowly Cavaliers. It wasn’t the most emphatic prelude but at least San Antonio avoided a devastating loss, right? The 116-110 victory improves the Spurs to 44-32 and now they are one win away from clinching yet another postseason appearance. On Thursday night, the Cavs scored the first basket after halftime to extend their lead to 11 points. San Antonio then finished the third quarter by outscoring Cleveland 40-26, giving the good guys a three-point advantage heading into the fourth. In the final period, it appeared as if the Spurs were going to run away with it when Davis Bertans hit a three-pointer with 9:13 remaining to increase the lead to nine points. However, the Cavs battled back and actually led the game as late as the 3:32 mark at 106-104. Thankfully, key three-pointers by Rudy Gay and Patty Mills down the stretch helped the Spurs eke out the victory. 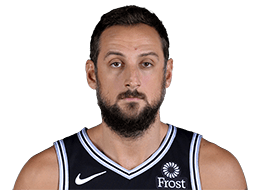 Gracias, Manu. Oh, and gracias Los Spurs for not tainting the noche with a loss. 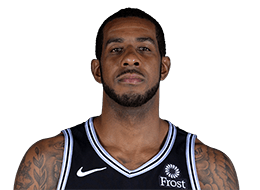 This was a low energy performance by LaMarcus Aldridge. Defensively, he made a couple plays down the stretch but was largely missing in action on that end. Offensively, he was inefficient scoring-wise, didn’t do much passing-wise and was only occasionally physical. Viewing his total of three rebounds and three free throw attempts in 36 minutes helps paint the picture of how passive Aldridge was on this night. Summary: Aldridge didn’t play hard enough. It was a tale of two halves for DeMar DeRozan. In the first half, he was practically invisible. 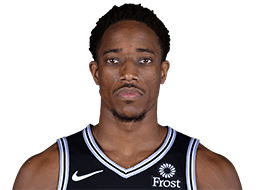 In 16 minutes in the first two quarters, DeRozan had four points and one assist. In the second half, he was wonderful: he scored 21 points and handed out seven assists in 19 minutes over the final two periods. For the game, it’s difficult to be too upset with DeRozan considering he had 25 points on 12 shots. That said, the Spurs can’t afford for their main playmaker to be on the side of a milk carton for half the game. Defensively, DeRozan was better than usual but wasn’t overly energetic. Summary: DeRozan was really good in the second half. 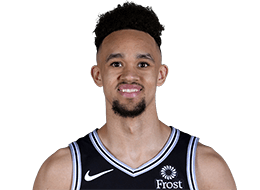 Foul trouble derailed Derrick White’s night in the first half. He picked up two fouls five minutes into the first quarter and then picked up his third foul 12 seconds into the second quarter. Though he played more in the second half, White never really provided much of anything. His defense was weak, which really hurt the Spurs because he’s by far the team’s best perimeter player. With White spending a lot of the game trying to avoid fouls and going through the motions, San Antonio predictably struggled on that end. Offensively, he was slow to get the team into their sets and wasn’t doing enough to put pressure on an overmatched Cavs squad. With White’s uneven play as of late, you have to wonder whether he’s either not 100% healthy or whether he’s tired at the end of his first real NBA season. 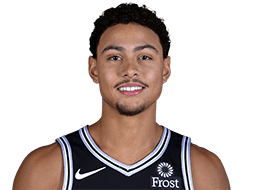 Bryn Forbes was one of the liveliest players tonight. He was focused from the start and remained in attack mode. I didn’t love all of his shots but his aggressiveness is what the doctor ordered. Forbes got lucky a few times when he jumped with nowhere to go only to get bailed out by teammates catching difficult passes … but, again, the aggression was appreciated. Defensively, the effort and physicality were there but the results were lacking, as he had trouble staying in front of the quicker Cavaliers players. Summary: Forbes sparked the Spurs. The good: He was very active in terms of going for blocked shots. 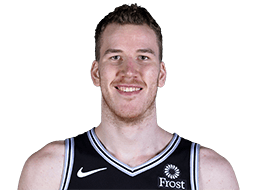 Jakob Poeltl’s protection of the rim was elite and he was also helping out on the perimeter. He did well on the offensive end keeping his head up and being ready for passes. The bad: This was the second straight game Poeltl was weak on the offensive boards. Considering he crashes the offensive glass on most shot attempts, it hurts the transition defense if he isn’t grabbing offensive rebounds often enough to cause the opposition to account for him. It also appears as if Poeltl’s free throw woes have gotten into his head, as he hoisted an air ball at the charity stripe. Summary: Poeltl was trying to load up on blocks but could have done more. 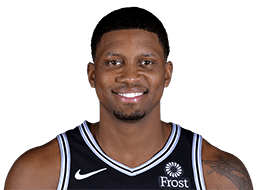 Rudy Gay did this evening what he’s done for the last couple weeks. Well, truth be told, tonight he only grabbed eight rebounds (in the last four games, Gay had grabbed exactly nine boards). On offense, he gives the second unit a focal point and someone who can punish mismatches. His perimeter jumper looked smooth and the three he hit late to give the Spurs a three-point lead was momentous. Defensively, his mobility – or lack thereof – limits his value but when he’s rebounding and using his length and physicality, he can provide assistance on that end from time to time. Summary: Gay continues to provide value off the bench. With his idol getting his jersey retired, Marco Belinelli had a really good game offensively. He even hit a couple left-handed shots in the lane in Ginobili’s honor. Overall on offense, Belinelli was assertive, moved well with and without the ball, and provided quality ball-movement. Defensively, though, he gave back a lot of his good offensive work. He was unfocused in transition, slow to rotate and wasn’t playing good individual defense. 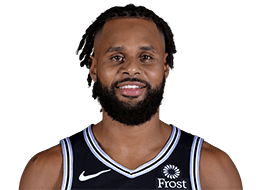 Summary: Belinelli was great on O, not so much on D.
Patty Mills saved his best for last when he canned a three-pointer with 14.5 second remaining in the game that gave the Spurs a four-point lead. Prior to that shot, Mills hadn’t done a whole lot right. He wasn’t bashful about shooting but his accuracy waned. His passing was sloppier than usual and despite good effort on defense, he was a liability on that end. Mills was animated and obviously wanted no part of a loss before the Manu festivities and, to his credit, his big shot helped seal the deal. Summary: Mills got to celebrate a key three-pointer down the stretch. 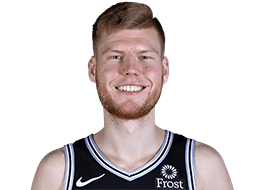 Davis Bertans did well enough. The Cavs are actually an awkward fit for the Latvian as there weren’t a lot of natural matchups for him to go up against. Not surprisingly, his defense suffered a bit. But Bertans was still able to aid the cause in other ways. He drilled three more three-pointers, continued his expanding use of dribble moves, delivered a couple nifty one-handed passes and helped out on the boards. Summary: Bertans did more good than bad in his 16 minutes. Pop should bottle whatever he said to DeRozan at halftime. His decision to play Mills down the stretch paid dividends. Giving extra minutes to Forbes was also the right move on this night. On the other hand, I didn’t like that Pop dusted off Dante Cunningham and allowed him to play four ineffective first half minutes. With the defense struggling, a few more minutes for Poeltl could have helped. 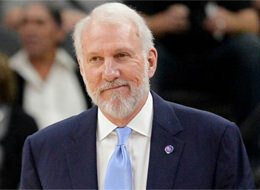 Summary: Pop was able to wake the Spurs up just enough to avoid embarrassment. Looking ahead: By the time the Spurs play the Kings on Sunday in San Antonio, they may have already clinched a playoff berth. If not, a win against Sacramento will do just that.